Activated Carbon Filtration | Sewer Pure | General Carbon Corp. The General Carbon Sewer Pure system controls offensive odors escaping from manholes. Foul smells generated in sewage collection systems or forced mains are vented through a canister containing activated carbon. Contact with the carbon cleans the vent air of many of the contaminants that are the cause of bothersome complaints. The system is made of two pieces, the first being an isolation skirt. This durable plastic fabrication is field trimmed to fit underneath the manhole cover. It seals escaping air inside the collection system and directs it to a center opening. 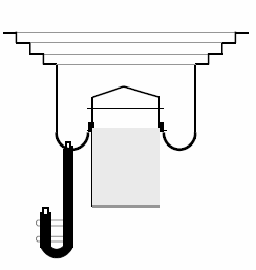 A drain device allows collected water to drain into the sewer system without releasing noxious fumes. The second piece of the system is the media canister. It is made of corrosion resistant PVC and is inserted into the center of the skirt. A gasket seal prevents air from bypassing the canister. The odorous air enters through the canister bottom, travels up through the media and is exhausted through the top cover. After the media becomes spent and requires change-out, the canister lifts out and can easily be serviced. Several different kinds of activated carbon and potassium permanganate impregnated media are available to treat almost any problem.